Our story begins in the year 1987 AGROROFF started with the supply of processed potatoes to supermarkets in the country. Today AGROROFF has more than 25 years in the market of vegetables and fresh fruit in the domestic and international markets specializing in potatoes, avocado and citrus among others. 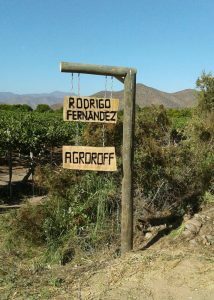 2014 AGROROFF joined the association of exporting producers Fruit North (FRUNOR) and North Naviero Group (GNN). Since then began its operations with export to Asia, North America and what is now its main market Europe. Over the past both its production volumes as planting projects have been growing, always looking for the best terroir for different types of crop production in the 4th region of Chile, Coquimbo. AGROROFF Mission is to offer its customers the best in quality and safety of its Chilean fresh produce both national and foreign territory. The vision is to become globally recognized by the characteristic of its products and the efficiency of our work.